When working in your QuickBooks file, issues like slowness and freezing can result in lost productivity. Be proactive! Take a few minutes now to make sure your file is in good working condition, rather than having to spend hours fixing a problem when your free time is at a minimum. Some problems encountered in a hosted QuickBooks desktop file can be avoided by maintaining a Healthy QuickBooks company file. A failed banking import or a pending update, cannot be prevented. However other issues which can result in lost productivity, such as slowness and freezing, can be avoided through the use of features built-in to the QuickBooks desktop application. 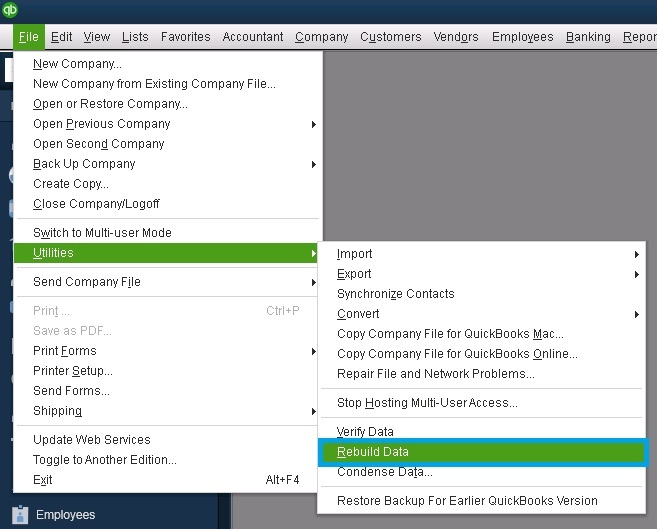 Here are some of the proactive simpler techniques to ensure your hosted QuickBooks company file says in good working order! This will scan your file for signs of data corruption and instability. By running this process frequently (Intuit recommends every week or two), problems can be detected before they impact your productivity. If there are any issues with your file, you will be prompted to rebuild your data file. This is almost as easy as verifying your data! QuickBooks will prompt you to make a backup of your file before you complete the rebuild. After the Rebuild completes, newer versions of QuickBooks will provide you with a list of the resolved issues as well as any it was unable to fix. NOTE: Verify & Rebuild are incredibly versatile and easy to use in newer versions of QuickBooks. However, “Rebuild Data” can cause additional damage to an already heavily corrupted company file in older versions of QuickBooks. A little known trick to increasing the performance of a company file is to create a portable copy of the company file and restore the portable file, replacing the old company file. This re-indexes the company file so that if the data is correct but being misread, the restoration of the portable can eliminate some issues reading the data. NOTE: It's a good idea to delete all old/stale/outdated backup or portable files in your hosted server directory to save space given the space imitations. Once you successfully create a backup and/or portable file, delete the old ones. These two options for maintaining a healthy QuickBooks company file are a proactive solution to many issues that can spring up unexpectedly due to data or file problems. How do you keep QuickBooks defaulted to multi user mode?